THE DAY THAT raked in the most sales for the Dáil bar this year was 14 June – the day Leo Varadkar became Taoiseach and announced his new Cabinet. Varadkar’s appointment this year drew a significant amount of international media coverage due to his youth, ethnicity and sexuality, which was seen to clash with Ireland’s former image as an insular, Catholic nation. On the day of his appointment, Varadkar changed the roles of a number of figures in Cabinet, including moving Frances Fitzgerald from the Department of Justice, to Business and Innovation. Other significant moves included moving Simon Coveney to Foreign Affairs, and appointing Eoghan Murphy as Minister for Housing. As the political heavyweight Michael Noonan tied his retirement to Enda Kenny’s, Paschal Donohoe was given the two portfolios of Public Expenditure and Finance. The Dáil bar took in €4,610.60 that day, which is the highest amount of the year, but is significantly less than its top-earning day last year, where €11,738.14 was earned on the first day of the new minority-government convening. Two other dates on the list of top five busiest days were linked to the Fine Gael leadership challenge earlier this summer. The third busiest day in the Dáil bar was 22 February when former Taoiseach Enda Kenny told Fine Gael party members that he would deal with the leadership issue “effectively and conclusively” after St Patrick’s Day. He had been expected to announce his definitive departure at that meeting. That night, €3,559.70 was spent on drink at the Dáil bar. 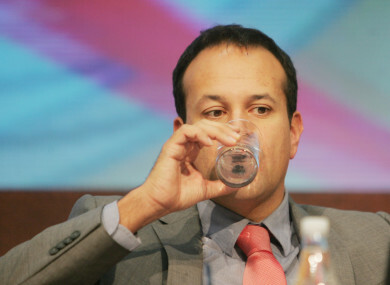 The fifth busiest day was 10 May, when rumblings of a Fine Gael leadership challenge were well underway – and Leo Varadkar said he was feeling “totally zen” about it all. Other political news on that date included the Jobstown trial and Minister Shane Ross announcing a €30 million upgrade to four roads. A total of €2,715 was spent in the Dáil bar that day. The second busiest day at the Dáil bar this year was 12 July, which brought in €3,663.90. That day, the Summer Economic Statement was announced and it emerged that there is just an extra €300 million to spend when compared to 2016. The fourth busiest day was 10 October – no surprises there, as that was the day Leo and Paschal announced their first Budget. In Budget 2018, the government promised an extra €500 million to build 3,000 new social homes, weekly social welfare payments are to increase by €5, and cigarettes, sunbeds and sugary drinks are all set to become more expensive. Between 1 January and 30 November 2017 26,835 beverages were sold, with a sales total of €114,201.80. There’s a significant drop in the figures of the busiest Dáil bar days this year when compared with last year. The most lucrative three days for the Dáil bar brought in €11,738.14; €6,096.80; and €5,851. They were for the evening of the new minority government, the Budget Day, and the announcement of Enda Kenny’s new Cabinet respectively. The numbers are also lower than the previous year too, when the top earning day for the Dáil bar brought in €7,461.19. Email “The busiest day in the Dáil bar was the day Leo became Taoiseach”. Feedback on “The busiest day in the Dáil bar was the day Leo became Taoiseach”.